This year's official Archbishop of Canterbury's Lent Book is a breath of fresh air for your prayer life, with it's practical and thoughtful readings. Want to renew your prayer life? The official Archbishop of Canterbury's Lent Book for 2018. Have you ever felt a stumbling block in your prayers? Something you just can’t say, or don’t know how to say? Or even just want a breath of fresh air for your prayer? Say It To God is not a step by step formula for turning prayers into Gold, but an exercise in trust. Trust in God. There are no specific word you need to utter, but rather you’ll find a world of reassurance and theological insights into prayer that will get you started on a road to a deeper, ,more meaningful prayer life. In the pages of Say It To God you’ll find no jargon, and don’t need a turn to a glossary with every page. Rather, much like its specific, laconic title of Say It To God, the advice and investigations found inside begin with the Bible and end with thoughts and prayer to carry through the Lent Period. No matter how small, beige, or seemingly mundane something can be, prayer can find a place there. Loftness is not the goal of the book, but rather guiding you to a life-giving, everyday prayer routine. Like talking deeply with an old friend. The book also includes a foreword by the Archbishop of Canterbury, Justin Welby. Say it to God by Luigi Gioia was published by Bloomsbury Publishing PLC in November 2017 and is our 11157th best seller. 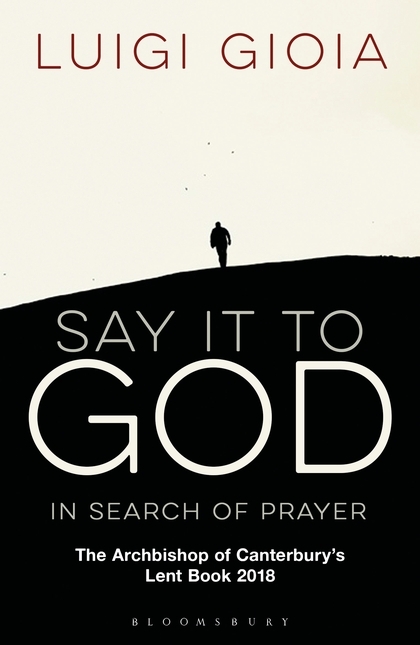 The ISBN for Say it to God is 9781472941756. Be the first to review Say it to God! Got a question? No problem! Just click here to ask us about Say it to God. In Say it to God Luigi Gioia provides a welcome encouragement to all those who feel the need to freshen their practice of prayer. For Gioia, prayer is not about methods or techniques, but trusting that God is truly interested in everything that happens to us and wants to hear about it. The book leads the reader into the theological aspects of prayer and how it relates to Christ, to the Holy Spirit and to the Church. This is done without using complex theological concepts but simply through scriptural quotations. Chapters are kept brief intentionally to make the book suitable for daily reading over the Lenten period. With a foreword by the Archbishop of Canterbury, Say it to God demonstrates that the everyday, even the most mundane of tasks and situations, can be applied in deepening our practice of prayer.